IDDRG National Secretary for Czech Republic » COMTES FHT a.s.
Antonín Prantl, an employee of COMTES FHT, has been appointed the National Secretary of IDDRG (International Deep Drawing Research Group) for the Czech Republic. 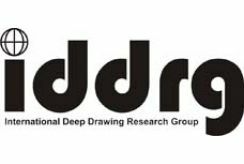 This international society for deep drawing research coordinates research and development work in sheet metal forming on the basis of collaboration and exchange of information between scientists, researchers and those working in industry. It provides an open and scientifically recognized forum to its members to present their research and development findings on sheet metal forming.